The Carol 600 appeared in the fall of 1962 with a larger 586 cc RA OHV engine and longer at 3,200 mm. The extra length was due to more prominent bumpers, passenger space was as restricted as in the 360. Weight ranged from 560 to 585 kg (1,235 to 1,290 lb). It was also available as a four-door sedan, ahead of the lesser Carol 360. The car was called the "600" or "P600" in export markets. At home, there was a Standard two-door, and DeLuxe two- or four-door versions. Production ended in November 1964, after the introduction of the more spacious Mazda Familia 800 sedan version. Around 8,800 Carol 600s were built. With the revival of the Kei class in the late eighties, Mazda revived the Carol name for its 1989 Autozam Carol. The recently introduced Autozam was to be Mazda's youthful brand and was used on Mazda's kei cars for some time. 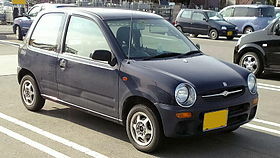 The Carol was produced for Mazda by Suzuki, and while it used the Suzuki Alto's platform and mechanicals, its interior and boldly curved exterior were largely unique. 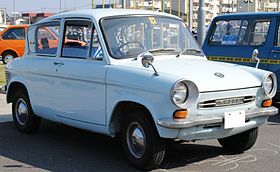 Its round headlights and cute appearance were very much a product of its time and followed upon the heels of similar designs such as Nissan's Be-1 and Pao. It was either front (AA5PA) or all-wheel drive (AA5RA) and its SOHC 547 cc 3-cylinder Suzuki F5B engine produced 40 PS (29 kW) at 7,500 rpm. The Carol had a 2,335 mm (92 in) wheelbase for a total length of 3,190 mm (126 in) and was 1,295 mm (51 in) wide. Brakes were discs up front and drums in rear. Equipment levels were e, f (also 4WD), and the top g version. The g featured a Canvas Top. Four-wheel drives received a five-speed gearbox, while the front-wheel drive versions received a four- or five-speed manual or a three-speed auto. 550 cc Carols are rare, as production ended after only five months. New Kei car regulations for 1990 allowed manufacturers a bigger engine and an extra 10 cm of body length, and Mazda quickly brought out an updated Carol. New regulations brought about the replacement of the 1989 Carol within 4 months. 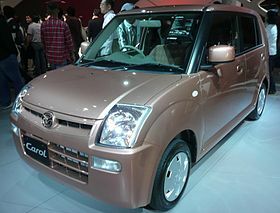 The new car was 6 cm longer and used a larger 657 cc Suzuki F6A engine with 52 PS (38 kW). The car is easy to tell from its predecessor by its clear headlight covers. In 1991, Mazda offered a 61 PS (45 kW) turbocharged engine, and the car was lengthened to 329 cm in 1992. An entirely new Carol appeared in October 1998 as a 1999 model, this time with the Mazda brand name. Unlike previous Carols, this model was similar to the Suzuki Alto. This Carol was available with either front or all-wheel drive and used the old 657 cc F6A engine or a new 658 cc DOHC unit. It was closely related to the AZ-Offroad and AZ-Wagon introduced at the same time. Mazda has launched a new Carol in December 2009, as 2010 model, which was first revealed at the 2009 Tokyo Motor Show. The Carol has been updated alongside its sister, the Suzuki Alto. Like the Alto, the Carol is available with AWD and CVT. ^ a b c d "Mazda Carol 360 - Blueprint". The-Blueprints.com. Retrieved 2013-12-03. 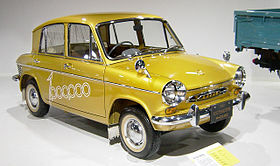 ^ a b 360cc: Nippon 軽自動車 Memorial 1950→1975 [Nippon Kei Car Memorial 1950-1975]. Tokyo: Yaesu Publishing. 2007. pp. 58–59. ISBN 978-4-86144-083-0. ^ 絶版車カタログ 国産車編 Part1 1950~1969 (Eichi Mook) [Japanese Vintage Car Guide: Car Catalog part 1, 1950–1969]. Tokyo: Eichi Publishing (英知出版). 1996. p. 62. ISBN 4-7542-5055-9. ^ Quattroruote Speciale: Tutte le Auto del Mondo 1967. Milano: Editoriale Domus S.p.A. February 1967. pp. 173–174. ^ Rees, Chris (1995). Microcar Mania. Minster Lovell & New Yatt, Oxfordshire, UK: Bookmarque Publishing. p. 80. ISBN 1-870519-18-3. ^ Nippon Kei Car Memorial, p. 61. ^ a b "Encyclopedia of Carol". Mazda Carol-360 Page. Retrieved 2010-10-05. ^ Car Graphic: Car Archives Vol. 5, '70s Japanese Cars. Tokyo: Nigensha. 2007. p. 89. ISBN 978-4-544-09175-5. ^ a b c d e "1963 Mazda Carol 600 specifications & performance data review". Automobile Catalog. Retrieved 2013-12-03. ^ "Mazda Carol (1989.10-1990.02) Catalog" (in Japanese). CarSensor Lab. Retrieved 2010-10-07. ^ a b c d e f "Mazda Carol GS AT 0.66 (2010)". Tradecarview. Retrieved 2013-12-03. Wikimedia Commons has media related to Mazda Carol (sixth generation).